To turn lines of text into a bulleted list, select the text and then, on the Home tab, in the Paragraph group, click Bullets. Each line or paragraph becomes a bulleted item. You can also create a bulleted list from your keyboard by typing * (asterisk) followed by SPACEBAR (solid bullets) or by typing - (hyphen) followed by SPACEBAR (dashes). 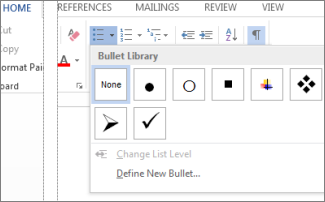 Choose a bullet style and start typing.